Langer grew up in Bavaria, where his father owned a small business and taught glider pilots on the side. His dad taught him to fly, too, and at 14 Langer completed his first solo trip. He loved the silence of flight (“A special experience,” he says. “It’s totally silent, and you fly over the glaciers.”) and was intrigued by the planes’ aerodynamics. He found an early angel investor in another laser entrepreneur, Falk Strascheg, who had sold his company, Laser Optronic, to publicly traded U.S. competitor Coherent in 1981, and was looking to invest. Strascheg, who’s now 78 and one of Europe’s top investors, backed EOS with $500,000 in seed financing. Langer took Strascheg’s advice to start small, and EOS’s first product was a simple device that could scan physical objects to digitize them in three-dimensional form. Langer brought the new scanner to a trade show. BMW’s scouts saw it, and the carmaker became a customer—a blip for its budget but a big deal for Langer. Meanwhile, BMW had been testing 3D Systems’ new 3-D printers and wanted to change the printers’ specs, Langer recalls, but couldn’t get the American firm to reconfigure them. (BMW and 3D Systems declined to comment.) When Langer learned this from his BMW contact, he pounced. He asked the contact if BMW would give him the budget, 50% payable upfront, to design a 3-D printer in 12 months. “He said, ‘But you cannot deliver. You don’t have the people, you don’t have anything, you don’t even have a drawing,’ I said, ‘This is a bet. We do not,’” Langer recalls. Langer’s contact passed the idea up the chain of command, and BMW—which was an early user of 3-D printing technology and has 3-D printed more than 1 million parts over the past decade—said yes. Langer delivered his new 3-D printer. In three years, EOS’s revenue reached $6 million. As Langer’s business grew, General Scanning’s concerns about patent litigation proved prescient. 3D Systems sued EOS for patent infringement in 1993. Facing a lengthy court battle and significant legal fees, Langer and Strascheg sold 75% of EOS to Carl Zeiss, the German optics company; Langer kept the remaining 25%. Zeiss agreed to invest (and to cover the costs of the patent battle) in hopes of turning EOS into a $100 million business. The sale allowed Langer to move beyond prototyping and begin developing polymer and metal powders for functional parts. In 1994, EOS started making 3-D printers that use laser-sintering, in which lasers selectively melt powdered material to build parts from the bottom up. That technology is the core of its business today. In 2016, in one of the industry’s biggest bets on the potential for 3-D printing technology, GE’s then-CEO Jeff Immelt shelled out $1.4 billion for two European 3-D printer manufacturers to bring the technology in-house. But before that, GE approached EOS, which was far larger than the two combined. Industry sources say the price GE offered was over $2 billion, and perhaps much higher. Langer, who lives modestly in the home he and his wife bought in the 1980s and drives a four-year-old Volkswagen Golf, said no, as he has said no to many other rich offers over the years. “I talked to our children and said, ‘Why should we do this? Why should we do it?’ We have enough money. We have everything,” he says. EOS’s customers include some of the largest industrial companies in the world: Boeing, Siemens, Lockheed Martin, BMW and the like. ArianeGroup, a joint venture of Airbus and the French aerospace company Safran, used EOS’s printers to redesign an injector head of a rocket engine (one of the core elements of the propulsion module that feeds the fuel mixture to the combustion chamber), cutting the number of components to one from 248 and reducing production time to 35 hours from three months. Ruag, a Swiss company that supplies products to the space market, meanwhile, redesigned an antenna bracket used as a support structure in the Sentinel satellite. The 3-D printed aluminum alloy bracket featured lots of air space in the design and weighed 40% less, yet showed improved stability. 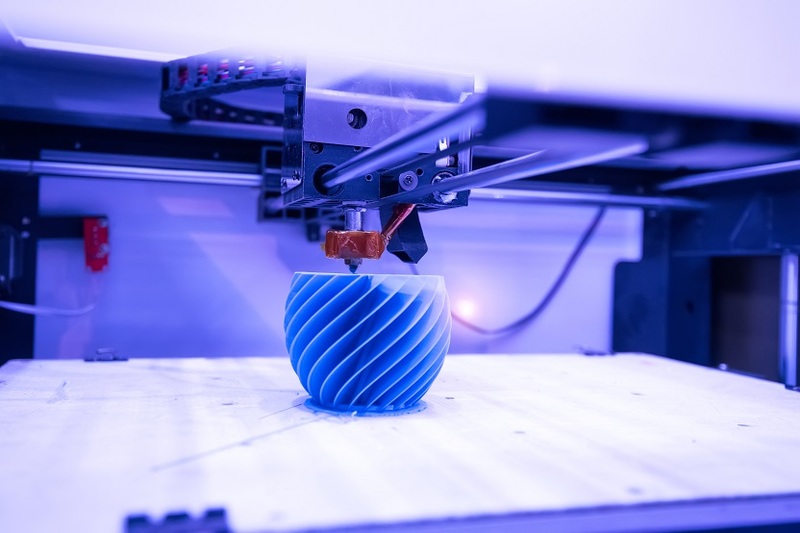 “You start to enable changes in the design that were impossible to dream of even five years ago,” says Peter Adams, president of Burloak Technologies, a 3-D printing contract manufacturer that has seven EOS machines in a new factory in which it is investing $100 million. EOS’s 3-D printers are exacting enough to be used for production in regulated industries like aerospace and medical. But competition in industrial 3-D printing, especially for the printing of metals, has heated up as big players and startups alike try to come up with new technologies that are better, faster and cheaper. “A lot of people would like to have a system like EOS or [GE’s] Concept Laser, and it’s too expensive,” says Ric Fulop, the CEO of Desktop Metal, which claims its machines are dramatically faster and less costly than laser-based technologies like those from EOS. The result of the increased competition and array of new technologies is likely to be a split, with different machines used for different projects, and larger factories using 3-D printers from multiple manufacturers alongside more traditional manufacturing technologies. Jabil, the contract manufacturer, for example, has purchased industrial-scale 3-D printers from EOS, HP and Desktop Metal. “You may use EOS to produce a mission-critical component, and another manufacturer to produce other parts,” says Pete Basiliere, a research vice president at Gartner. Langer and Keppler hope to win with innovations to EOS’s machines as well as a new consulting division. One of the dirty little secrets of this business is that some companies spend millions on 3-D printers and then don’t know how to use them to make the investment worthwhile. Others know they need a 3-D printing strategy but don’t know what to do at all. In one of its consulting projects, EOS worked with Daimler Group’s EvoBus, Europe’s largest bus manufacturer, to figure out how 3-D printing might help it manage more than 320,000 spare parts that were taking up space in warehouses. Could it redesign parts? Keep fewer items on demand and print them as needed? As a start, EOS helped EvoBus identify 2,600 parts that might be 3-D printed, and then selected 35 metal and polymer components for a test. EvoBus is now working toward its goal of printing items only as needed for repair. At EOS’s headquarters, in a building with bent aluminum siding that appears almost 3-D printed—a design idea of Langer’s—there are 100 3-D printers in operation in a private research area off the lobby. It is, EOS executives say, the largest collection of 3-D printers in operation anywhere in the world. EOS uses this tucked-away lab to test parts for its customers and to come up with new ideas for what its printers can do. At a trade show in Chicago last September, EOS introduced a new series of metal printers with more laser power and greater flexibility to choose the number of lasers used. Then in Frankfurt in November, it showed off a new polymer printing technology that includes one million diode lasers to speed up production time. On the horizon is the possibility of creating different properties in metal within the same part, something that can only be done with lasers during the melting process. That would allow even greater possibilities for designs that push the boundaries of functionality and efficiency. “What this means is that you can build new designs for the rocket guys that they have been desperately waiting for,” Langer says. Within Langer’s 3-D printing ecosystem, there are a lot of moving pieces beyond the printers themselves. Scanlab, founded in 1990 and owned through a separate holding company (of which the Langers own roughly one third), makes scanning systems to deflect and position laser beams in three dimensions. These systems go inside EOS’s 3-D printers—and its competitors’ printers—as well as other industrial products. Annual revenues from Scanlab and related companies are now over $170 million. Another piece separate from EOS Group is AM Ventures, a venture firm that has minority stakes in 20 startups focused on technologies related to 3-D printing. With each new investment, EOS can exercise sales and marketing rights to the technology. Among its bets: Dye Mansion, which adds precision coloring and high-quality finishes to 3-D printed items, and whose finishes are already being offered to customers, including EvoBus. Over the past three years, Langer has been working on succession planning, and talking with his son, Uli, 35, a physicist, and his daughter, Marie, 32, a psychologist, about the roles they might take in the business. To help with the discussions, he brought in Michael Bordt, a Jesuit priest who heads the Institute of Philosophy and Leadership at the Munich School of Philosophy. Bordt, author of numerous books including The Art of Disappointing Your Parents, has worked with other wealthy European families on business succession, as well as with executive teams from corporations that include BMW and the chemical company Wacker Chemie. Bordt’s intensive coaching process uses meditation and goes deep into helping people understand their own motivations, and he works only with business owners willing to accept that their children might say no. “We try to discern the different inner motivations and emotions and wounds. Sometimes the children don’t believe it’s okay to say no because, of course, sometimes the parents are disappointed when the children say no,” Bordt says. In September, Uli and Marie (who declined through EOS to be interviewed for this story) started shadowing their father, attending meetings with him and getting a taste of all facets of the business. Within the next six months, they will take their first leadership positions within the family’s companies.